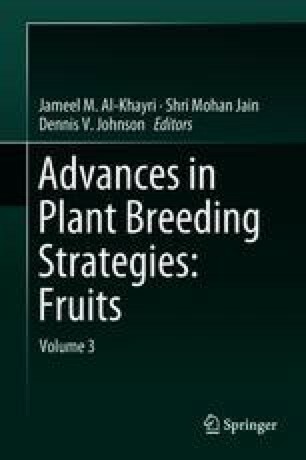 Despite over 6000 plum cultivars from 19 to 40 species that have originated in Europe, Asia and America, used for fresh market, processing, canning, drying and deep freezing, there is a continuing need to develop new cultivars through different breeding tools as the requirements of industry and market change. Most plums grown commercially are either hexaploid, Prunus domestica L. (European or domestic) or diploid, P. salicina L. (Asian or Japanese). The main goal of breeders of European plums are cold hardiness, modest tree size, self-fertility, regular productivity, excellent fruit internal and external quality, storage ability, resistance to Plum pox virus (PPV) and, recently, tolerance to climatic change and poor soils. Problems that compromise the production of Japanese plums are susceptibility to spring frosts, insufficient winter hardiness and limited soil adaptations. Basically, selection criteria are compatible in both Japanese and European plum breeding. Hybridization is still very popular in plum breeding programs. However, plum breeding using hybridization techniques is a very slow and expensive, so breeding work was stopped or been suspended for some time in many countries over the last few decades. Recently, research began on biotechnology with the aim of speeding up the breeding process by applying biotechnological methods and cytoembryological analysis. New cultivars in the near future will be developed using both conventional and genetic transformation techniques, especially in the private sector. This review is a synopsis of new European and Japanese cultivars and interspecific Prunus hybrids recently released around the world. Also, new breeding technologies are discussed. This very extensive, difficult and responsible job was realized with the unselfish help of colleagues around the world. We greatly thank Drs. M. Butac, A, Zhivondov, J. Blažek, M. Meland, Z. Grzyb, M. Sitarek, H. Itamura, I. Grâvîte and B. Krška.